Welcome to the ArtWorks School of Art! 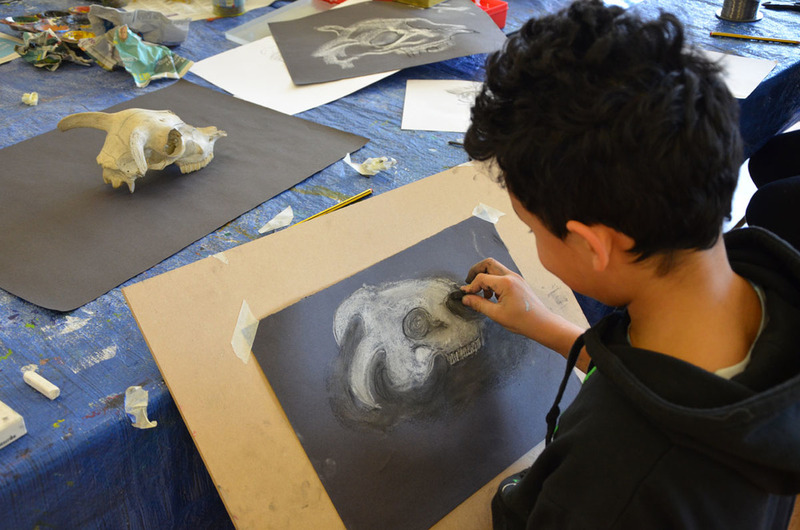 We are an Independent teaching studio passionate about art in all its forms and specialising in the tuition of Art to young people. We run classes from our light and well stocked teaching space at St Mary & St John Primary School in East Oxford OX4 1TJ. Once a middle school, St Mary & St John Primary School is a hidden gem. Built in 1975, it has generous proportions and is set away from the bustle of Iffley Road next to a nature reserve, with green woodpeckers, jays and deer sometimes making an appearance on the playing field. There is an adventure playground to the rear of the school which makes a welcome change of scenery midway through a holiday class. There is a large car park at the school convenient for dropping off and picking up. Our studio is the length of 2 classrooms with ample space inside and out for exciting projects. Within the studio students have access to a wide range of materials and techniques. Each student is seen as an individual with a course tailored to suit their specific interests. The classes have an art school feel about them with everyone working on their own different projects inspiring each other to try new things, with that wonderful cross fertilisation of ideas and processes. GCSE, A level and Portfolio advice. 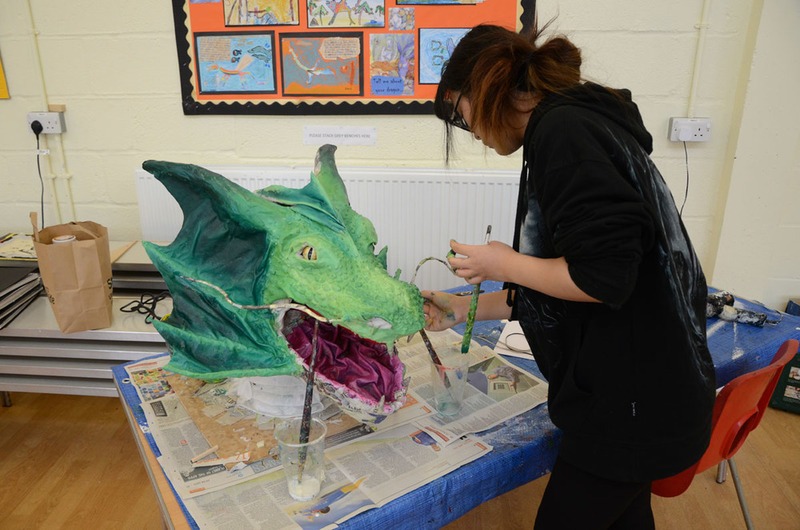 We have qualified Art Teachers who can support the GCSE and A level syllabus. 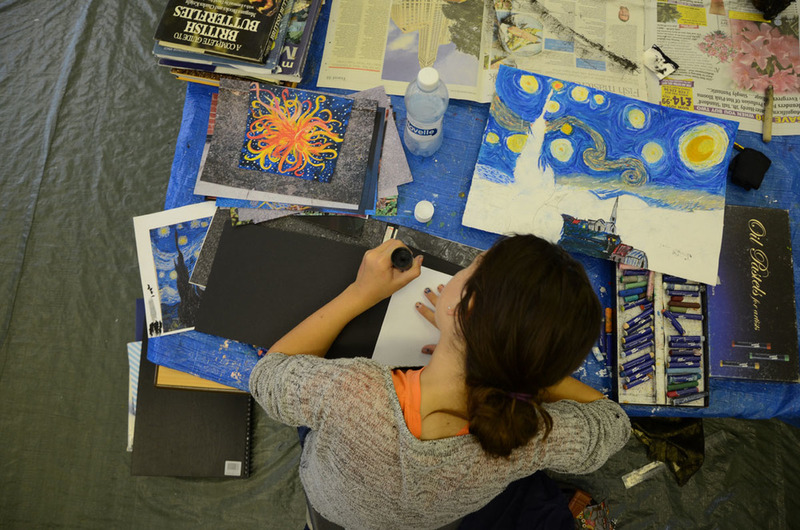 With the exams approaching there is the option in the regular classes of the Open Studio arrangement where students can stay for longer than their usual lesson to get their final exam preparation done. We have a large Art and Art History lending library and with an active interest in History of Art we can give essay advice via email in between lessons to GCSE and A level students. Another way we promote the students individuality is by offering Explorer, Bronze and Silver Arts Awards - an accredited Award set up by the Arts Council and Trinity College. ArtWorks runs after school, weekend and holiday classes. Please see COURSES for more information. To contact us and for further information please see our CONTACTS and DIRECTIONS page. Jo Acty was born in Maidstone Kent, studied Fine Art at Maidstone Art College, Winchester School of Art and Brookes University. She started ArtWorks in 1989 and has been a freelance artist and teacher within the Oxfordshire area and Devon for over 28 years. She has worked in Schools (Nursery, Primary and Secondary), Museums. Hospitals, libraries, Nature Reserves, secure facilities and youth groups. She loves teaching and sharing skills and is especially excited by materials. She works in a variety of media and works to commission and has exhibited in Oxford, London and Devon. Her own work explores the theme of liminal and transient places and the link with our emotional landscape. Helen Edwards was born in South Africa, grew up in several countries overseas as an expat and returned to the UK at the age of 15. She studied Fine Art (BA) at Brookes University, specializing in printmaking, performance Art and Film. After gaining her PGCE in Secondary Art, Craft and Design she has taught in several schools in Oxfordshire and Buckinghamshire. 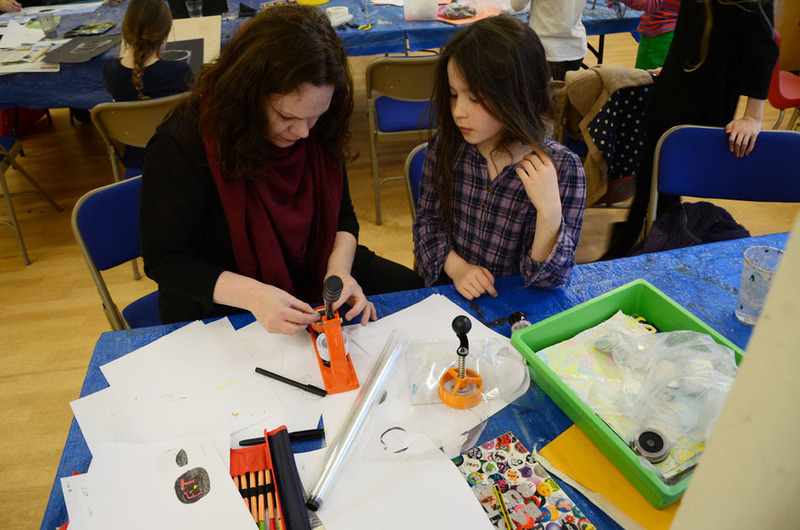 Helen has 20 years teaching experience, including Montessori Nursery, Primary, Secondary and Adult tuition and has been a tutor at ArtWorks for 11 years as well as being an Arts Adviser. Her work is primarily focussed on culture, water and communication influenced by her transient childhood. Helen exhibits during Artweeks and other venues in and around Oxford. Kieran Cox holds a BSc (Hons) Human Sciences from University College London, the course involved studying History of Medicine at the Wellcome Institute and Life Drawing at the Slade School of Fine Art. Kieran studied Foundation Art & Design at Oxford and Cherwell Valley College. He developed his Fine Art and critical theory skills studying BA (Hons) Drawing at Camberwell College of Arts, London graduating in 2010. Kieran is an experienced picture framer and has also worked as a scenic artist for theatre productions in London's West End, the Almeida Theatre and at Shakespeare's the Globe. He regularly works as a contractor for Garsington Opera at Wormsley's site team on bespoke projects. When not teaching at Artworks Kieran works in arts administration for an Oxford-based community arts charity. Grace Exley studied Fine Art at the Ruskin School of Art, Oxford and is now doing an MA at the Royal Drawing School in London. Her daughter, Berry, attends SS Mary & John, where ArtWorks is based. Grace loves to teach as she feels that it keeps her own practice fresh and inspired. She has exhibited her work many times in both group and solo shows. Daniel was born in Oxford. He achieved a distinction in his Art Foundation at Abingdon and Winey College and went on to study illustration in Bristol. In 2010 Daniel moved from Bristol to the coast of North Devon to work as a photorealist painting assistant for the artist Damien Hirst. Here Daniel gained a wealth of experience in many facets of the Art Industry with his primary focus being on painting artworks. He left in 2016 to pursue his own practice. He exhibits in Oxford and London and often works on commissioned portraiture. Since joining Artworks he has really enjoyed imparting his love for painting and drawing with the students and seeing them progress. The art is in helping them to see whilst giving them the space and freedom to have confidence in their own creativity. Simon Acty is an illustrator and designer with a further background in animation, fine art and film. A graduate of Animation and computer visual effects from Falmouth University, Simon is versed in various softwares and techniques for traditional/digital aided illustration and design. When not teaching and working at Artworks Simon is a professional Illustrator and Concept Designer working in the media industry.